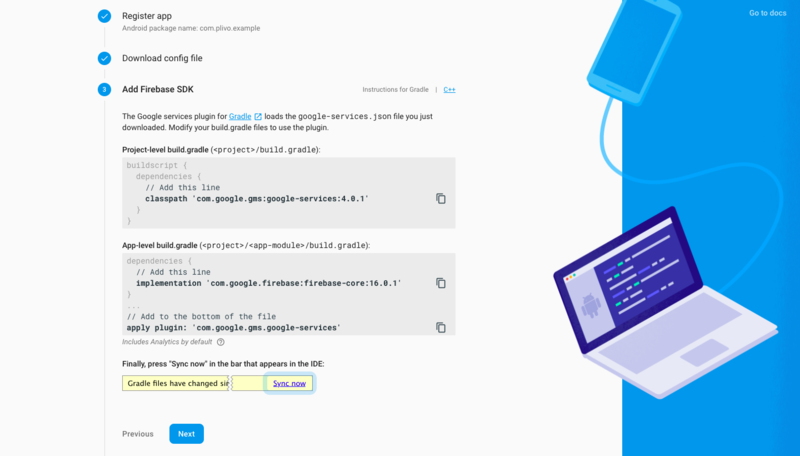 New Example application which covers all the SDK features. Declare or use user input for the sip uri endpoint and password from Plivo Console. 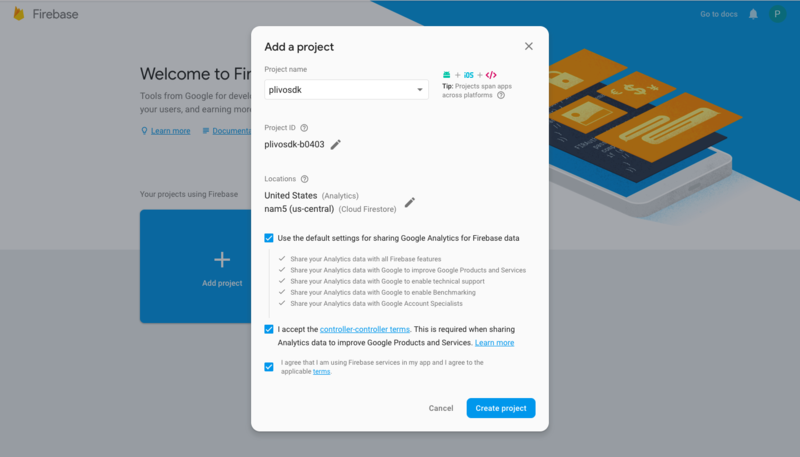 Login after fetching FCM token from Firebase. Refer the doc for more info on the login methods. Set NetworkChangeReceiver, in the onCreate() method of your class, to auto connect when the network is available. Endpoint class allows you to register a Plivo SIP Endpoint. Once an endpoint is registered, you can make and receive calls using the same. @param debug - Setting this to True turns on the Plivo SDK debug logs. Otherwise, false. @param eventListener - Login, Call events Callback listener. This method is used to register an endpoint with FCM token. If the endpoint is successfully registered, a notification will be sent to the onLogin method of the EventListener. In case of a failure, notification is sent to the onLoginFailed method of the EventListener. fcmToken - Device token obtained from firebase. 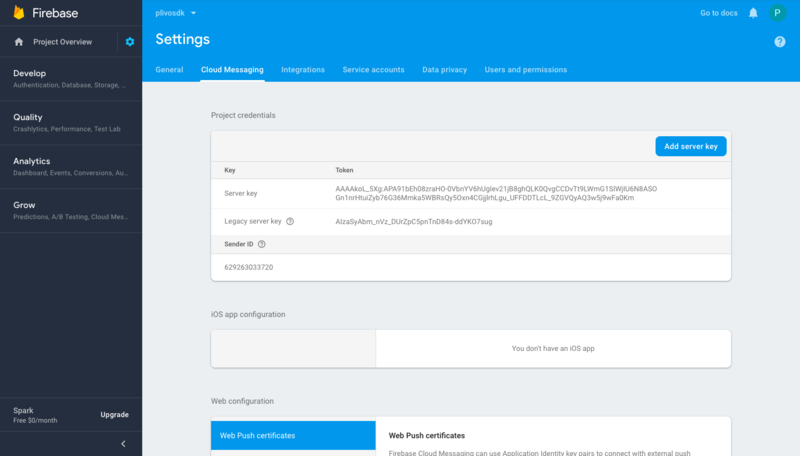 FCM Token is needed to alert the user about incoming calls using Firebase push notifications. This method is used to register an endpoint without FCM token. If the endpoint is successfully registered, a notification will be sent to the onLogin method of the EventListener. In case of a failure, notification is sent to the onLoginFailed method of the EventListener. Note: This login method has a limitation - Incoming call may not work if the app goes to background. username - The username of the endpoint created on Plivo. password - The password of the endpoint created on Plivo. regTimeout - Seconds to re register if the app is in foreground. Default value is 600 seconds. Value range is from 120 sec to 86400. This method is used to forward the FCM notification data to Plivo SDK. onIncomingCall() method will be called after calling this function. notification - Notification data from FCM. This method is used to unregister an endpoint. Calling this method would reset the Endpoint object. This method is used to re-register an endpoint when the application goes in and out of network connectivity. The Outgoing class contains methods to make and control an outbound call. Use the Call method to make an outbound call. Use the SIP URI or a number to make a call to. Calling this method on the Outgoing object mutes the call. Calling this method on the Outgoing object unmutes the call. Calling this method on the Outgoing object with the digits sends DTMF on that call. It is to be noted that DTMF input only supports 0-9 , * and # . Calling this method on the Outgoing object disconnects the call. The Incoming class contains methods to handle an incoming call. The public void onIncomingCall(Incoming incoming) eventListener will receive an object of this class. Use this method to answer an incoming call. Use this method to mute the call. Use this method to unmute the call. Calling this method on an already unmuted call won’t have any effect. Calling this method on the Incoming object with the digits sends DTMF on that call. It is to be noted that DTMF input only supports 0-9 , * and # . Call this method on the Incoming object to disconnect the call. Call this method to reject the incoming call. This method will be called when registration to an endpoint is successful. // notified that login is success and can proceed to other screens. This method will be called when registration to an endpoint fails. On an incoming call to a registered endpoint, this method receives an Incoming object. On an incoming call, if the call is rejected by the caller, this method will be triggered by the Incoming object. On an incoming call, if the call is disconnected by the caller after being answered, this method will be triggered by the Incoming object. On an active endpoint, this delegate will be called with the digit received on the call. Note: “*” and “#” are received as “-6” and “-13” respectively on the SDK. App need to explicitly convert these on this callback onIncomingDigitNotification(String digits). This delegate will be called with the Outgoing object when an outgoing call is ringing. // create call obj local to your app or app logic when outgoing call is ringing. This method will be called with the Outgoing object when an outgoing call is answered. This method will be triggered by the Outgoing object when an outgoing call is disconnected by the called number after the call has been answered. This method will be triggered by the Outgoing object when an outgoing call is rejected by the called number. This method would be triggered by the Outgoing object when an outgoing call is made to an invalid number. 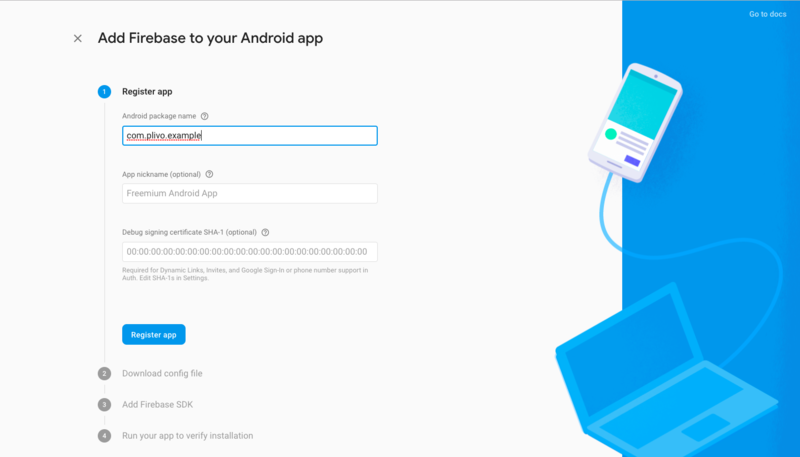 Register your app on Firebase. 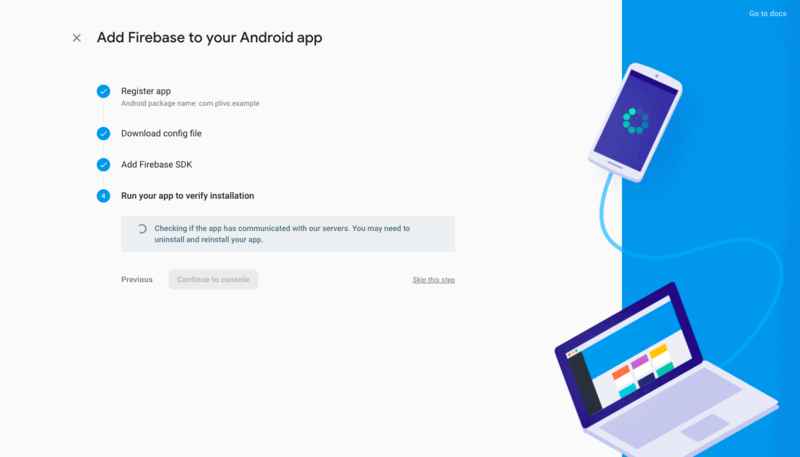 Add Firebase config file and SDK into your app. 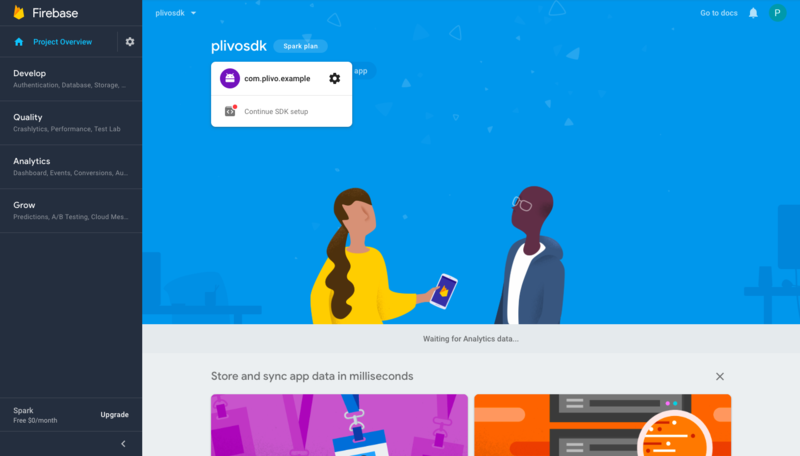 Copy Firebase project server key to Plivo Dashboard. Let us see each of these steps in detail. Add project name and click on “Create project”. 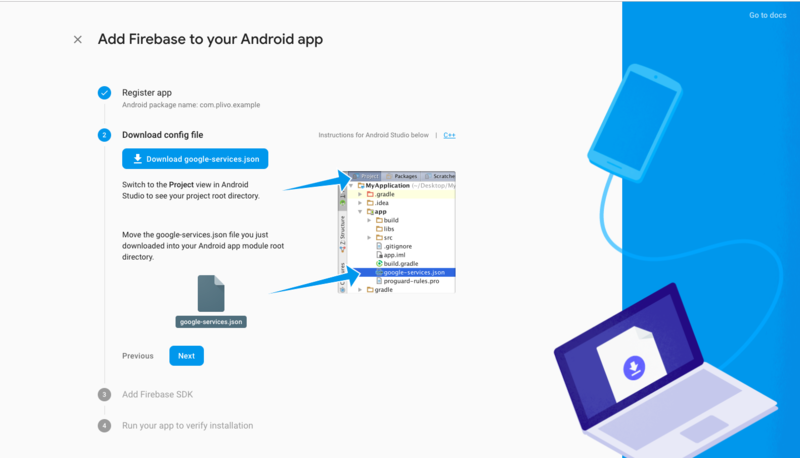 Go to Android section of your Project home page. Move downloaded google-services.json into your Android app module root directory. Make required changes to Gradle of your Android app as instructed. Wait for verification to be completed, then continue to console. In settings of the project, Server key are present under “Cloud Messaging” tab. 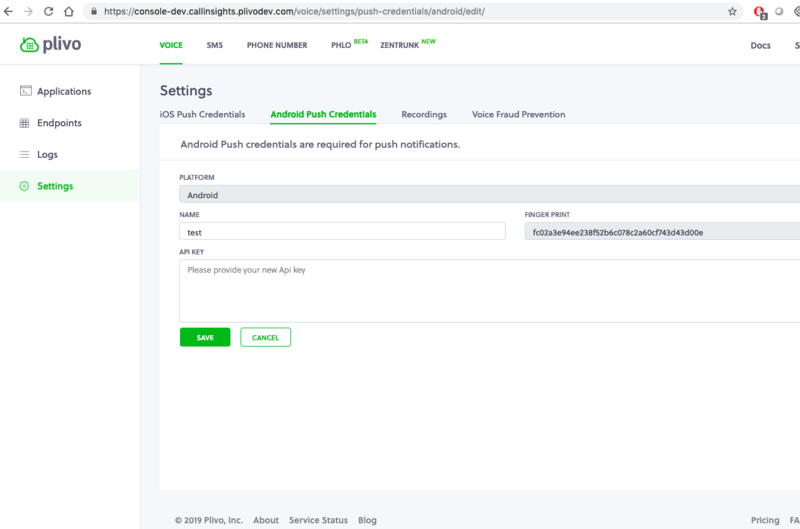 Add Server key to “Android Push Credentials” under settings, on Plivo Dashboard. Note: Only 1 server key can be added per account as of now. Plivo SDK Verbose Logs (Android application logs). Best Practice: is to not use the deprecated methods, because these will be prone to crashes NoMethodError when removed in future. Best Practice: Use the deviceToken while logging in to get the incoming call as push notification, instead of using the background service to run forever in the background and observe for incoming calls. BestPractice: Always use endpoint.resetEndpoint() while logout, so that all the allocated memory resources will be deleted on the SDK.